Worth a Ticket: Diesel and The Rock keep their pedals to the metal. If you want to feel truly American, try reflecting on the new FAST FIVE while wall-to-wall coverage of the British royal wedding is airing on the television before you. Every culture gets the pop entertainment it craves, and the dumb, disreputable mix of gunshots and explosions with chase scenes has been Hollywood’s territory since the days of The Great Train Robbery (and coincidentally, Fast Five opens with a pretty grand train robbery of its own). Remarkably, Fast Five, the latest in an originally low-rent franchise which has now survived for a decade–with its highest grossing entry ($353M worldwide) the last time around–may be the best entry yet in the series. The Fast of the title may refer in part to the sleight of hand the movie plays with its own franchise, a bit of a genre card-shuffle. For while it does open with that train being deprived of the fast autos in its cargo, and while there’s a genuinely spectacular car chase toward the end, most of the time Fast Five is a heist movie. Set, slightly confusingly, after Fast and Furious (the 4th movie) but before Tokyo Drift (the 3rd–that was the one, fans may recall, that ended with a cameo glimpse of Vin Diesel), Fast Five is mostly set in Rio de Janeiro. Our usual trio is reunited: Diesel, Paul Walker as his ex-cop sometime-adversary-sometime-colleague, and Jordana Brewster as Diesel’s sister and Walker’s girlfriend. After that train robbery goes wrong, and they cross the murderous path of crime boss Reyes (the reliable Joaquim de Almeida), they realize that to bring him down and steal all his money, they’ll need an Ocean’s Eleven type team that includes Tyrese Gibson, Chris “Ludacris” Bridges, Sung Kang and Gal Gadot. Meanwhile, in the movie’s true masterstroke, the team is being tracked by relentless DEA agent Hobbs, played by Dwayne “The Rock” Johnson; Diesel and Johnson are such outsized icons of testosterone that when they’re on-screen together, the movie becomes The Incredible Hulk as a duet. 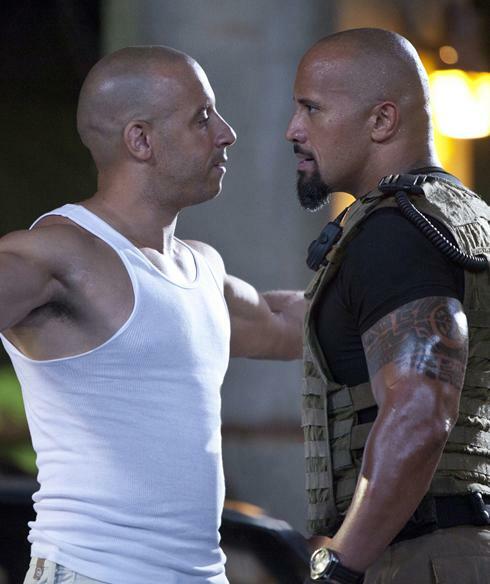 Fast Five doesn’t merit overpraise: Justin Lin’s direction is serviceable, not inspired, and the script by Chris Morgan could have used more humor and a hint of depth, especially since both Diesel and Johnson (if not Walker) have proved they can genuinely act when they have the material. Also, the storyline borrows so liberally from the Ocean’s series, The Italian Job, True Lies, Bad Boys 2 and others that it should practically bear their copyright notices. And yet, as we prepare to enter a summer of superheroes and fantasy, it’s rather nice to see a big-budget action picture that doesn’t overplay its CG, keeping the stunts, for the most part, within the realm of human possibility. This is Lin’s third entry in the series, and he knows his actors by now: Diesel doesn’t overdo the growling and become a cartoon, the way he did in Babylon AD, and Walker is mercifully content to stay in the background much of the time. Mostly, Fast Five is just fun, in its basically idiotic, mostly unsurprising way. The men are endlessly tough, and the women are without exception gorgeous (and pretty tough themselves). The pace holds for 130 minutes, and the thrills are delivered. This is what Hollywood franchises are supposed to do, and yet often can’t manage.